From the depths of the vast musical universe, MalLabel Music has travelled far and wide to capture the shining light and sounds of some of dubstep’s most talented artists. On the conquest to divine a collection of the greatest of the great, MalLabel has come into contact with one of the most unique and luminous of this ilk, hailing from New Jersey, USA: The Widdler. The Widdler should be well known to anyone who deftly travels the territories of today’s bass culture. 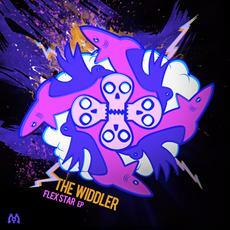 With such classics as Froggy Style, Lady Dub, and the Origin Album in his repertoire, it is with great enthusiasm that MalLabel presents his new masterpiece, Flexstar, a jaunty and jumpy ride through the type of terrain of complex and profound sounds that The Widdler is well known to command. Supporting the celestial brightness of Flexstar’s intense bass fueled beauty are three diverse remixes provided by some of San Francisco’s finest talents. Seasoned veteran Fresh Young Minds of the dynamic duo Blackheart provides a deep, driving, dance floor directed knocker. El Diablo, another staple in the stable of MalLabel’s crew of commanders delivers a drumstep refix bubbling to the brim with feisty rhythm. And finally, Porkchop, one half of the up and coming killers Adsum, has sequenced a sensational reflection of the track in a minimal and dark flavor. Be sure and grab the entire Flexstar EP, each of the diverse mixes of the original are sure to fit any listener’s mood of the moment, and every DJ will want the variety. Having passed the landmark half century in releases for Dub Police it’s time to celebrate and what better way to do so then to hand the reigns over to label head Caspa for the big 50! Following the release of the anthemic ‘Back For The First Time’ last summer on Sub Soldiers – which was vocalled by Mr Hudson as ‘Love Never Dies’ and the brutal ‘Neck Snappah’ earlier this year, Caspa returns with the huge ‘Fulham 2 Waterloo’. Driven by a hard 4×4 kick and galloping snares, the rhythm is overlaid with the snap of the half step snare providing an impactful percussive counterpoint that flips between house and dubstep. With the tough dancefloor foundations laid, it is the sharp, rave-inflected lead hook that provides an addictive rallying cry for club audiences everywhere. Having first been aired by Annie Mac on Radio 1 back in February, it has been getting heavy club support from Atrak, Breakage, Mista Jam, Annie Mac, Zinc and Emalkay to name a few and with forthcoming rubdowns from Roska and Emalkay Fulham 2 Waterloo is set to storm the summer soundsystem airwaves. ambassador for dubstep as he continues to spread some of the most exciting sounds to come out of the UK in years. Fresh back from Coachella Caspa now hits the road with an epic list of heavyweight forthcoming tour dates including Glastonbury where he will provide another outing of his’ Dubs, Decks and Visual FX’ multi sensory assault, followed onwards by Global Gathering and Creamfields amongst a massive run of forthcoming festivals and worldwide shows that take him to every corner of the globe, not to mention a 14 date tour throughout the USA in August which will be hitting some major venues alongside Digitalism. Touring is just the tip of the Iceberg, Caspa still finds time to host a bi-monthly night at the world famous Fabric and not content with running 3 labels, producing dancefloor bomb after dancefloor bomb and the acclaimed album ‘Everybody’s Talking, Nobody’s Listening’, his remix skills are in higher demand than ever, remixing for the likes of Katy B, Buraka Som Sistema, Deadmau5, Miike Snow, Swedish House Mafia, Depeche Mode, Kid Sister to name just a few.